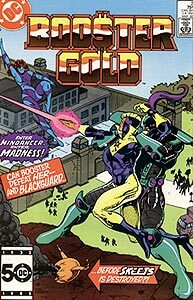 Cover Description: Booster Gold battles both Blackguard and Mindancer in front of a prison (presumably Metropolis Prison Complex) as Skeets is seemingly destroyed. Brief Synopsis: After last issue's defeat, Booster laments his loneliness and his separation from his family. Later, while filming a television commercial near a prison, Booster again meets and battles Blackguard and Mindancer. Issue Summary: Booster Gold recovers slowly from his defeat by Mindancer. Unfortunately for Booster and his public image, he is surrounded by reporters who harass him with questions about his recent loss. Booster is extracted from the situation by S.T.A.R. Labs scientist Dr. Klyburn. Mindancer takes the stolen goods to a secret headquarters 100 feet beneath Metropolis' Centennial Park, where she delivers it to the Director, leader of the 1000. The Director assigns Mindancer her new task: recovering Blackguard from Metropolis Prison so that he may be appropriately disciplined for his failure. Booster returns to his offices, where he is welcomed by the concerned Trixie Collins. His welcome is short-lived, as the pair are soon interrupted by a disappointed Dirk Davis. Booster storms out to his own penthouse residence where he and Skeets debate his future options. Unknown to Booster, Thorn stalks the streets, seeking evidence of the 1000's activities. The next day finds Booster Gold filming a commercial for Flakies Cereal at Metropolis Prison. Davis is still angry about Booster's televised failure to recover the guidance system, and his concern is shared by Booster's Creative Director Rose Forrest. However, Booster's spirits are buoyed by news from Skip Andrews that he will be starring in his own comic book. Elsewhere, two other people have Booster Gold on their mind. In his skyscraper, Booster's mysterious foe has failed to ascertain Booster's true identity but continues plotting against him unabated. In Goldstar offices, Trixie Collins holds the line against Booster's many petitioners. MEET THE PRESS: Though Booster is badly injured, he refuses to let Skeets help him until after he has spoken to the assembled Metropolis news media. Booster is accused of being a glory hound first and a hero second by Sam Carlson of Metropolis Today. This is the first time that this soon-to-be-common accusation is leveled against Booster Gold. It is a charge that he has always had difficulty defending himself against. This is another parallel between Booster Gold and Superman: as a reporter himself, Superman is generally well-received by the press. The media is far more critical of Booster Gold. Reilleau Towers is revealed to be the name of the building housing the offices of Goldstar, Inc. Located in the Business District of Metropolis, Reilleau Towers houses two dental clinics, three law offices, the McLellan and Johnson Advertising Agency, and other businesses (from Booster Gold #11, page 17). Second appearance of Mindancer (still unnamed). Mindancer is in Metropolis' Centennial Park, the largest park in one of the DC universe's largest cities. The park is based on Central Park in New York City, and in recent years statues of Superman and Superboy have been erected here. Mindancer enters a secret tunnel to the underground headquarters of the 1000. The entrance is in the base of a statue engraved with the partially visible words "Centennial Park, Established 187-." The final number of the year is off-panel. Though it appears that the statue may depict a horse, in the next issue, the statue will be revealed as a frontiersman holding a rifle, which is a very good way to keep the entrance to a secret underground lair a secret. FIRST APPEARANCE: First appearance of the Director of the 1000, frequently called only "the Director." The Director is as close as Booster has ever come to having an arch-nemesis. FIRST APPEARANCE: First appearance of Booster's cat Jill, having been mentioned in the previous issue (Booster Gold, Vol. 1, #1). It turns out that Skeets doesn't like cats. The proximity and pose of Booster's and Trixie's hands suggest an intimate relationship between the two. The possibility of a relationship between Booster and Trixie will be explored off and on throughout the first volume of Booster Gold. Booster first learns Mindancer's name when Skeets reveals that he has a "historical data bank" which contains the identity of Mindancer. Skeets indicates that Mindancer is a psychic and has a "record as an extremely dangerous villain." Though Mindancer has not appeared in the DC Universe in recent years, her body count in the Booster Gold series would bear the accuracy of this information out. HIS STORY: Booster laments that he "can't even go home." This is the first hint among many of Booster's troubled personal history. The narrative balloon indicates that this is the second day chronicled in the career of Booster Gold, making it October 18, 1985. PRODUCT PLACEMENT: In a television ad, Booster promotes Flakies, "the power-packed cereal!" This is the first product that Booster is seen promoting publicly on panel. BOOSTERRIFIC! COUNT: 2. Booster uses his personal catchphrase during a televised advertisement for Flakies cereal, a product he certainly doesn't personally use or enjoy. In this panel, the word is spelled "Boosterrific," with one extra "r" than its first appearance. This is the most common spelling of Booster's unique catchphrase. A production assistant calls in a pizza order for Booster; apparently, the superhero prefers mushroom, sausage, and onions on his pizza. 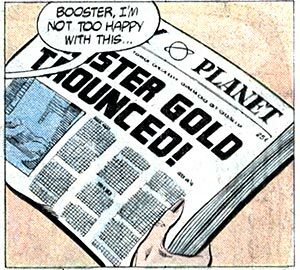 EXTRA, EXTRA: Booster makes his second cover appearance on the Daily Planet with the headline "Booster Gold Trounced!" Appearance of Rose Forrest as an assistant at the filming of Booster Gold's Flakies commercial. Rose is the alter ego of the super-heroic Thorn. As such, this is Booster's first published contact with an established DC Universe hero. PRODUCT PLACEMENT: Booster is excited to learn that he will be "the star" of his own comic book by Blaze Comics, publishers of such titles as Commander Courage and the Astro Teens. POWER UP: Skeets reveals that Booster's invulnerability is provided by a force field. This is the first indication that Booster's resilience and powers may not be entirely natural. Dirk reveals that his previous clients were pro-wrestlers, establishing himself as something of an experienced huckster for larger-than-life athletic characters who tend to falsify most of their exploits. He's a perfect choice for Booster's manager. Booster is revealed to have untraceable fingerprints. While not a super power, it is nonetheless an interesting clue to Booster's history. POWER UP: Booster describes his force field as "impenetrable." This is a reference to Dan Jurgen's originally planned origin of the force field, which is slightly different from the origin revealed later in Booster Gold #9. As revealed in Secret Origins, Vol. 2, #35, In early drafts of Booster Gold's design, he was planned to be using the force field of Superman's enemy Brainiac, whose completely "impenetrable" force field so stymied the Man of Steel that Superman devoted an entire room in the Fortress of Solitude to solving its mysteries. While Booster's force field may indeed by impenetrable, alas, it is not Brainiac's. Boosterrific Review: A solid second outing, this issue demonstrates Booster Gold's highs and lows. Without tipping his hand on the origin of the new mysterious celebrity hero, Dan Jurgens reveals the loneliness behind Booster's public facade even as he fleshes out Booster’s supporting cast. Booster's power is showcased in a rematch against Blackguard and Mindancer that leads directly into a cliffhanger for Skeets, which is surprisingly effective despite the fact that the characters are only in their second appearance. All this and a behind-the-scenes look at Booster filming a television commercial, too! One of the biggest draws to this character is the amount of sympathy he can invoke in his readers. Originally, with this series, it was definitely his past in the future that caused a lot of strife; with Booster Gold volume 2 it's the fact that he has to contend with looking like a buffoon and being treated like one, despite what is really going on. Not really much to add to Boosterrific's review though I do like the banter between Booster and Blackguard a great deal. Right, babyface?